How to decorate a cake "Napoleon"
Cake "Napoleon" is one of the most high-calorie confectionery products. Puff pastry and delicate cream makes the dish unforgettable and melting in the mouth. However, many of those who are trying to stay fit, avoid "Napoleon", because I know how many calories. This cake can be ready to buy and cook your own at home. If in the first case, the approximate caloric content of each serving will have to figure out the ingredients listed on the packaging, and in the second you can choose the recipe. The nutritional value of this delicacy is the caloric test and cream. 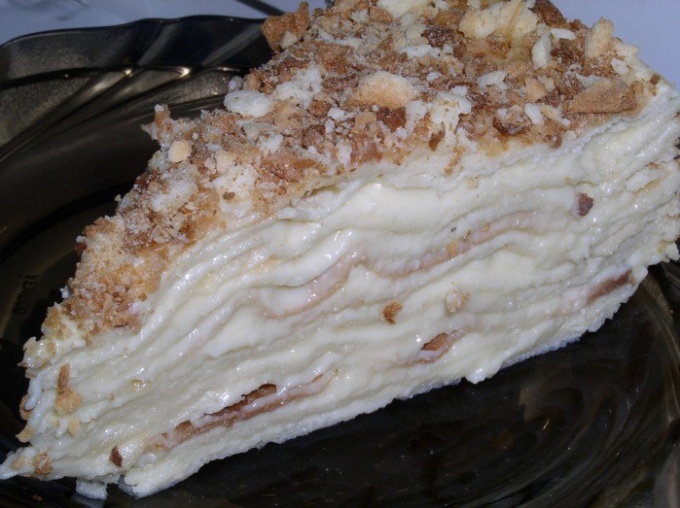 To make a cake "Napoleon" low calorie will not work at all desire - at least, it will be a completely different dish. Average servings of cake "Napoleon" contains at least 500 Calories. This number can be compared with 100 grams of pretty fat sour cream or 200-250 grams of sausage. How can you change the energy of this gorgeous dessert? First, in the preparation of puff pastry can be limited by water, not using milk and cream. With proper preparation and in this case the seams will be pretty delicate and slim, with butter or margarine within the recipe. The fundamental difference between using butter and margarine, according to some experienced cooks, no. It is only necessary to note that both of these ingredient approximately equal to its calorific value, and ghee is superior to them both in terms of calories. More attention requires the preparation of cream for the cake - it's hidden in here is quite a lot of opportunities to make Napoleon a little less caloric. For example, to reduce the amount of sugar - instead of 2-3 cups, as recommended in some recipes, take 1-1,5. How many amount you can sacrifice without sacrificing the taste and appearance of the cake, you can only determine by experiment, because the consistency of the cream depends not only on the amount of sugar, but also on the proper preparation process, the desired cream fat or butter, as well as a number of other factors. The special charm of this cake is in its allure - despite the fact that it is extremely high in calories, try a piece many want, and even those who usually tries to abandon the sweet, not to spoil the shape. Some Housewives are experimenting quite successfully, achieving good results, also reducing the amount of butter in the dough and in the cream or using low-fat sour cream. How many ingredients can be replaced in a classic recipe to keep the appearance and the taste of an exquisite cake can be determined empirically. Also quite famous recipe of "cheese" cake, when cream "Napoleon" is added low-fat cottage cheese, pre-shredded in a blender. This dish is suitable for those who are very sensitive to the amount of calories and for children. In extreme cases, instead of a handwritten cream, you can use ready-made whipped cream, which is now widely represented on the shelves. The number of calories in similar products indicate on the packaging that allows you to make the right choice. Not to mention that in this case, of course, the cake will be rather something like a "Napoleon" very far from its true taste and appearance.